There are a lot of ways to make pie dough – here’s a good, basic one you’ll find yourself coming back to again and again. Like many of the pie pastries I make, this one uses a combination of solid vegetable shortening for flakiness, and butter for flavor. Combining them in roughly equally proportion seems to yield just the right balance of great taste and desirably shattering texture. Here are a few tips to keep in mind when you make this. -You’ve heard it before, but you really should read the recipe through before you begin, so you know what to expect. -Get out all of your necessities before you begin – ingredients, bowl, measuring cups and spoons, pastry blender, plastic wrap, etc. Put them all nearby in your work area. Your hands are going to get floury when you mix the dough and if you’re anything like me, you’ll leave a flour trail across your kitchen if you skip this step. -Measure/cut up your shortening and butter and put it aside on a plate in the fridge for 10 minutes before you use it. -If you’re wondering whether or not you’ve cut your fat into your dry ingredients quite enough – this can be a tricky call if you’ve never made pastry – err on the side of a little too much cutting rather than too little. -Ice water means ice water: put a few pieces of ice in your (liquid) measuring cup, add almost twice as much water as you need, and let it sit while you get things ready. When you need it, remove the ice and pour off the excess water, leaving just as much water as called for. -Identify your pastry. This is a good idea if you have multiple pastries in your fridge at any given time, or – like me – you rock at Jeopardy! but you can seldom remember where you put your reading glasses. (Does They’re on your head, honey sound familiar?) Write the name of the pastry on a piece of paper, the date, what you plan to use it for, and any notes that might help later, like: needed less water than expected. Put this note and the plastic-wrapped pastry in a quart freezer bag and refrigerate. -This pastry will keep for up to 3 days in the fridge, but it will take on an increasingly ugly gray color each day it sits. So use sooner than later. Good luck! 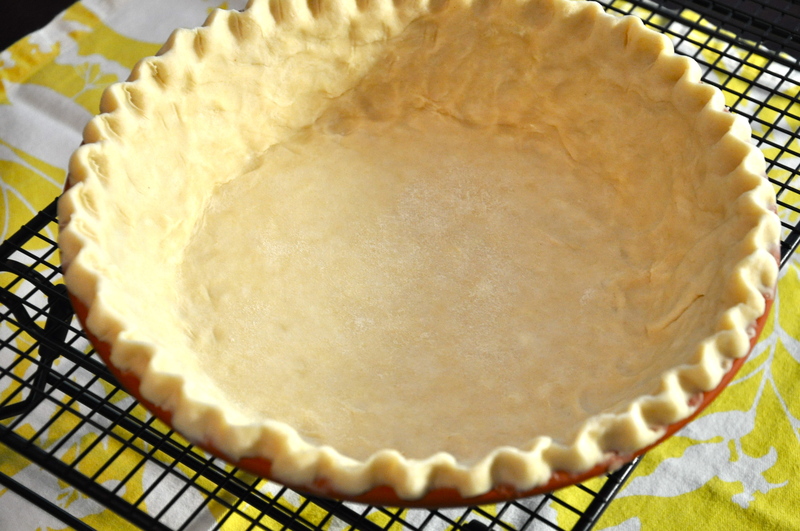 A simple, reliable pie crust you'll find yourself making often. Tip: make this twice, while all your ingredients are out, so you have an extra pastry on hand. Wrap as indicated and freeze for up to 1 month. Combine the flour, sugar, and salt in a large mixing bowl. Add the butter and toss gently with your hands, to coat with flour. Using your pastry blender, cut the butter into the flour to break it up partially. Large, random-size pieces of butter will remain. Add the cold shortening, toss lightly, then continue to cut both fats into the flour the flour has a meal-like consistency. All of the flour should look as if it has been "touched" by the fat, and small, split pea-size pieces of fat should remain. Drizzle ¼ cup of the water here and there over the mixture. Using a pastry fork or other large fork, quickly stir the mixture with a few strokes, "lifting" the mixture up from the bottom of the bowl as you stir. Sprinkle on the remaining water and continue mixing, with as few strokes as possible, just until the dough pulls together. Gently pack the dough into a ball. Place the dough on a long sheet of plastic wrap and dust it lightly with flour. Flatten the dough into a disk slightly less than ¾" thick. Wrap in the plastic, place this inside a plastic bag, and refrigerate for at least 1 to 2 hours before rolling. Makes a single crust for a 9" - 9½" standard or deep-dish pie.